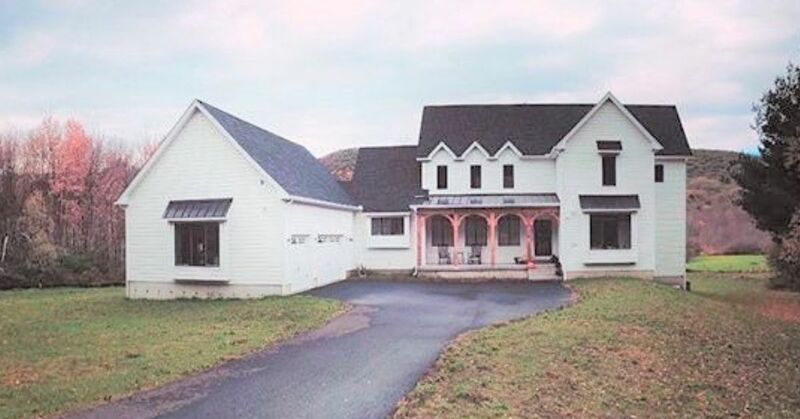 When your family's name is Strange, it's inevitable that the custom farmhouse you build is also going to be unique. 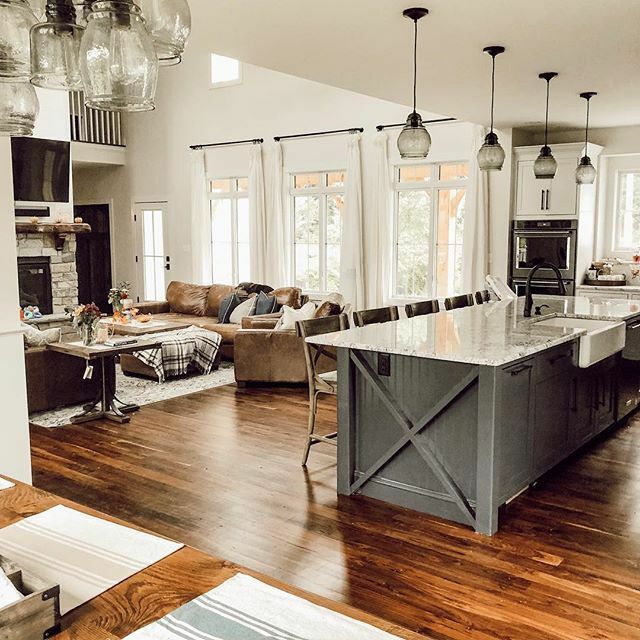 Set on 10 acres of land in western Massachusetts, Jacob and Cheri Strange built their new family home after years of planning, saving and, oh yes, filling a binder of favorite finishes and fixtures. They began by choosing a floorplan. They fell in love with Plan 62544DJ from www.ArchitecturalDesigns.com. Next came the challenge of finding a lot with a beautiful view. After that, it was time to get to work building their forever home. 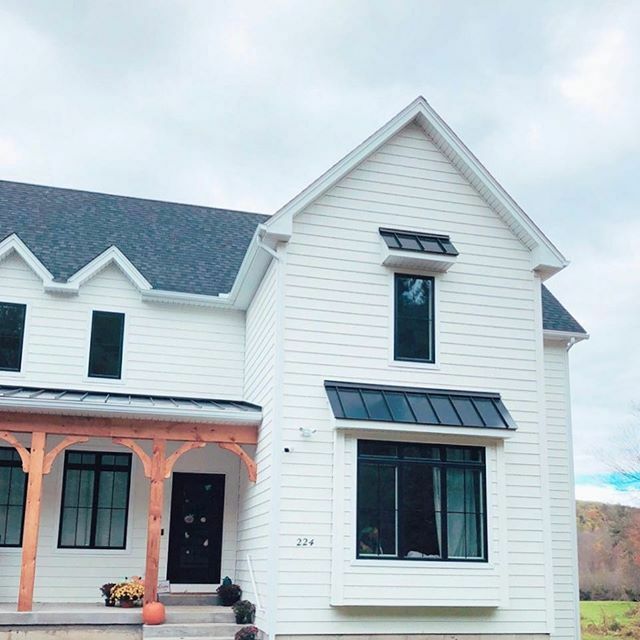 The black shingles and metal roof overhang are a striking contrast with the white straight edge shake shingles on the home's exterior. The porch and the clean lines are a mixture of rustic and modern. 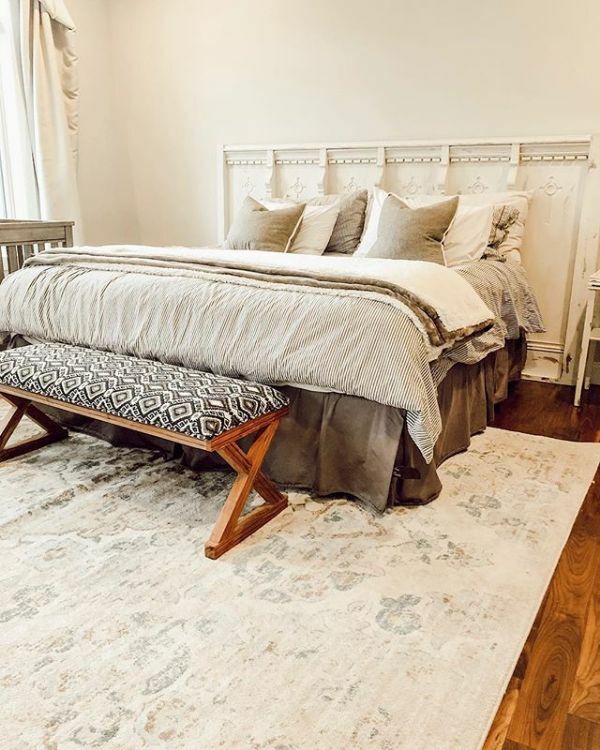 The hardwood floors throughout the home are 5-inch character grade walnut. The great room and the kitchen have an open concept that works well for large family gatherings. This is truly a great room. 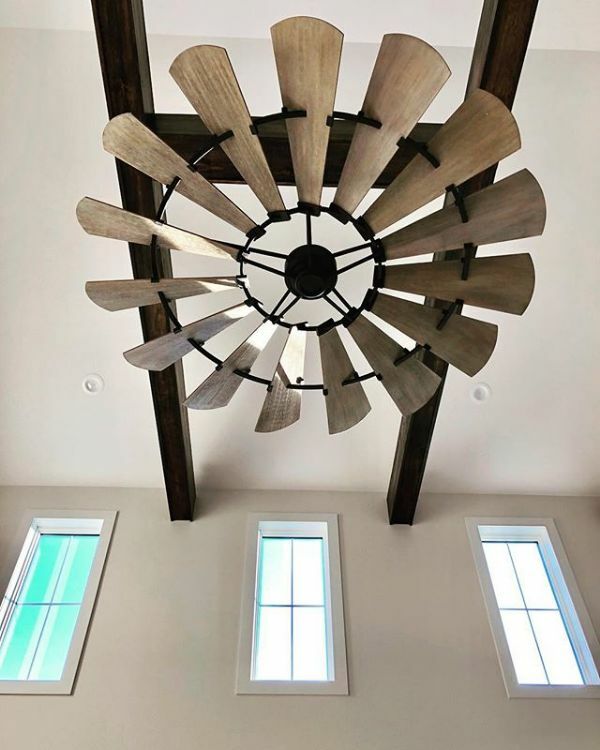 The cathedral ceiling reaches 24 feet high, and those who raise their eyes to admire the wood beams at the top will notice the amazing windmill ceiling fan. 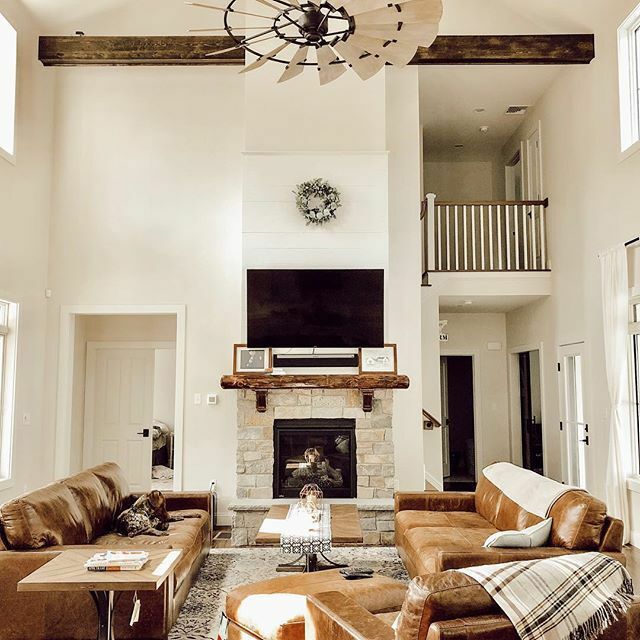 The windmill ceiling fan is whimsical and beautiful – an industrial element set against the rustic wood beams of the vaulted ceiling. 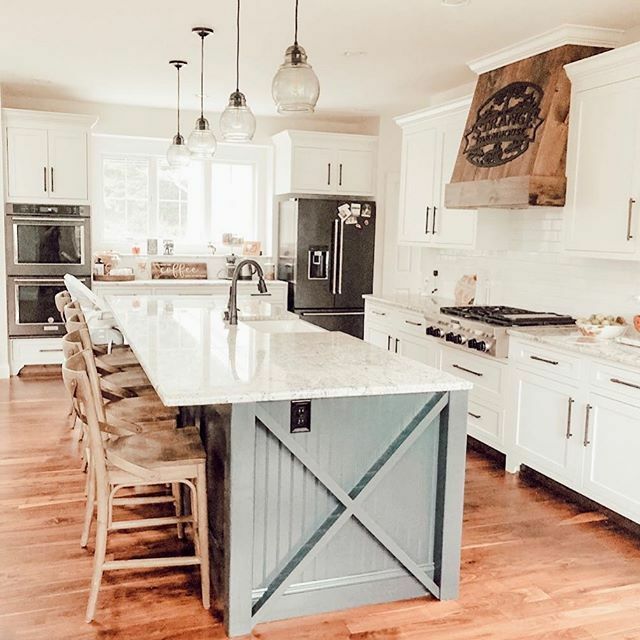 It brings to mind the very definition of farmhouse chic. 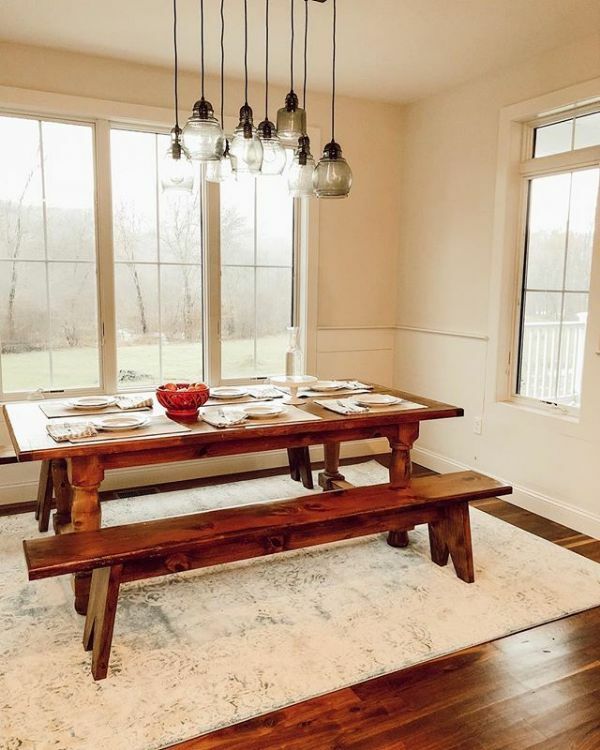 Another reason that the kitchen has a cozy farmhouse feeling is because the dining table is custom made from reclaimed barn wood. Shiplap covers the wall up to the chair rail. A soft rug rests on the floor, and the room features an exquisite glass and wrought-iron chandelier. Spend some time at www.strangefarmhouse.com for tips on where to find many of these same items. The glass pendants above the kitchen island perfectly complement to the chandelier over the kitchen table. 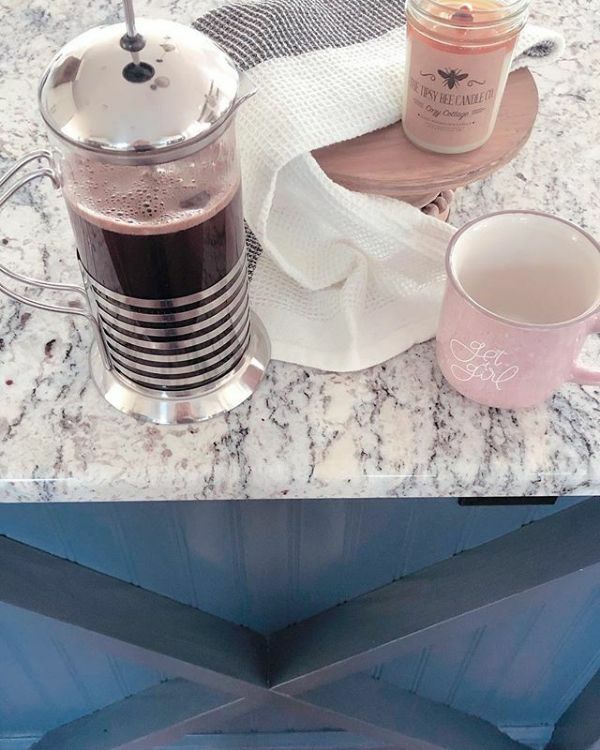 What could be better than enjoying the view of the nearby woods while preparing an afternoon coffee? 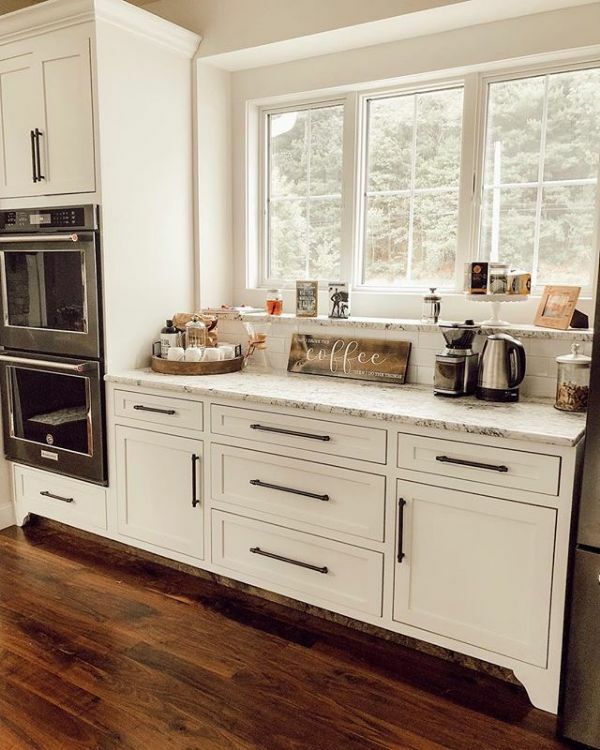 Everything needed is right at hand and easy to find in the custom cabinetry. Note the oil-rubbed bronze handles on the drawers and cabinets. 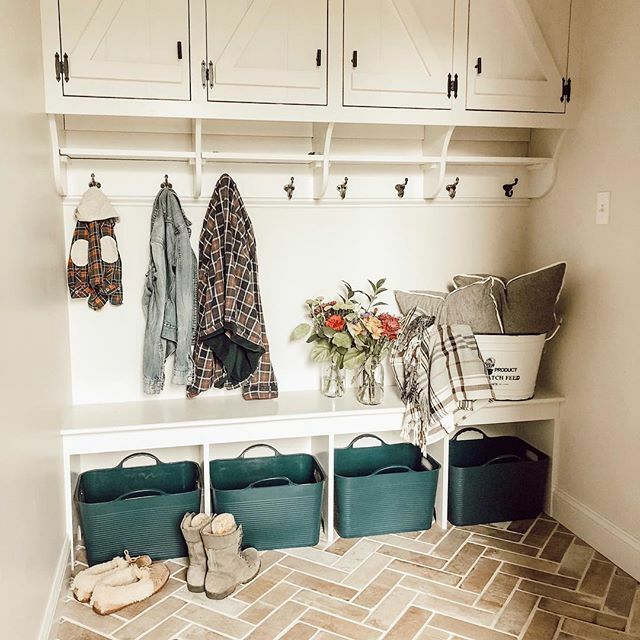 After a walk in the woods, it's a delight to come back inside to this charming mudroom. Baskets on the herringbone floor store anything wet or muddy, and a comfortable bench offers a place to sit while removing shoes. Hang a coat and scarf on the hooks before putting on slippers. 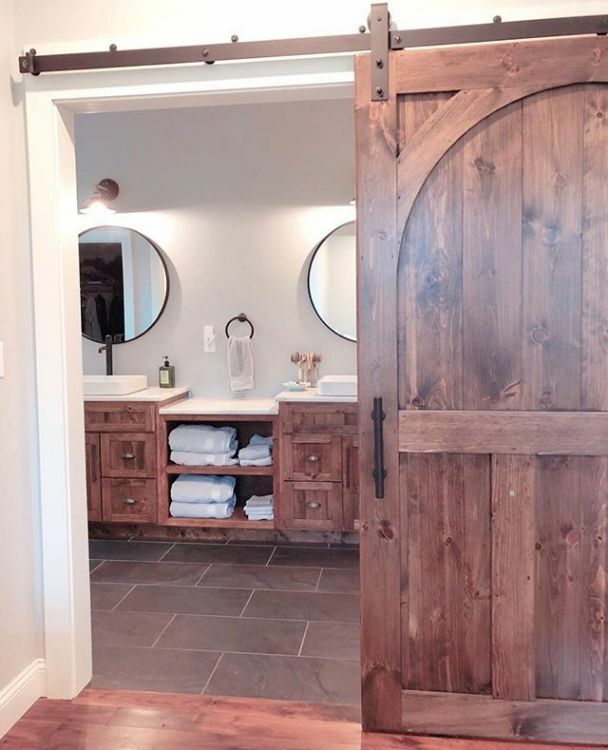 A barn door effortlessly slides back to reveal the well-appointed master bathroom. 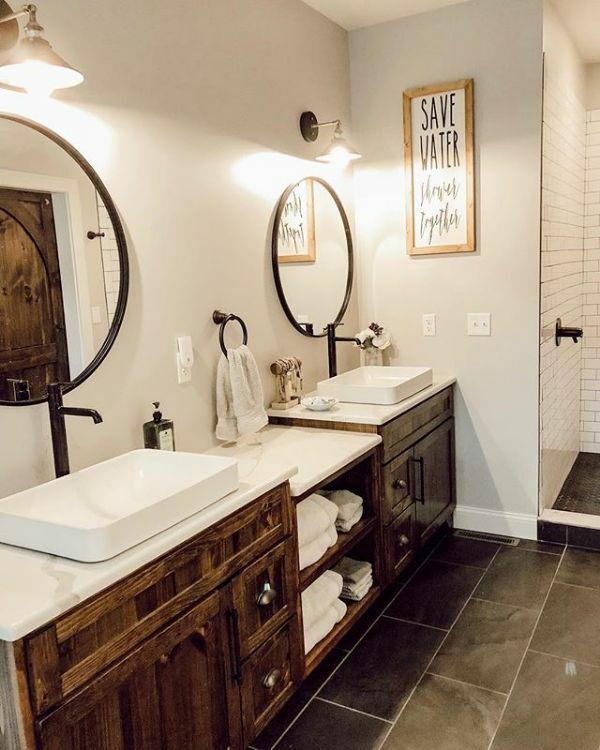 The master bathroom features quartz counter tops, vessel sinks and cabinetry stained dark walnut. 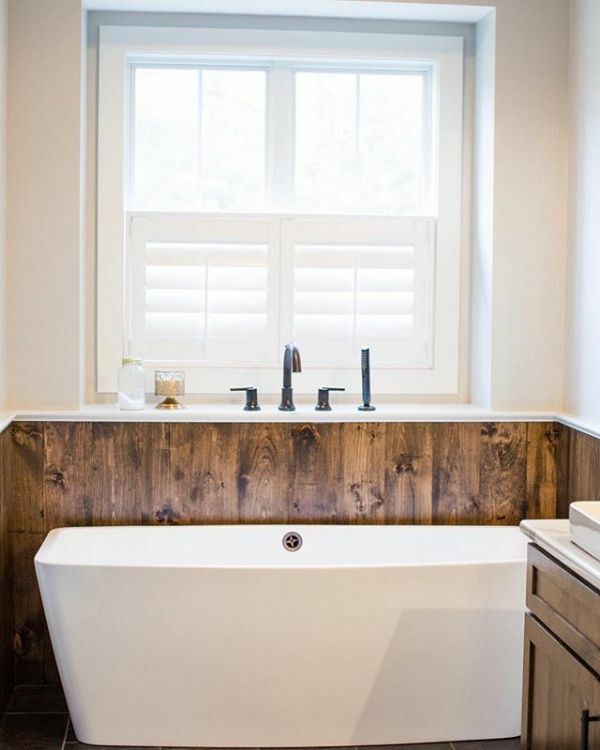 A stylish bathtub beckons those who seek a hot, relaxing bath. A nearby picture window offers natural sunlight and a chance to enjoy the scenery. 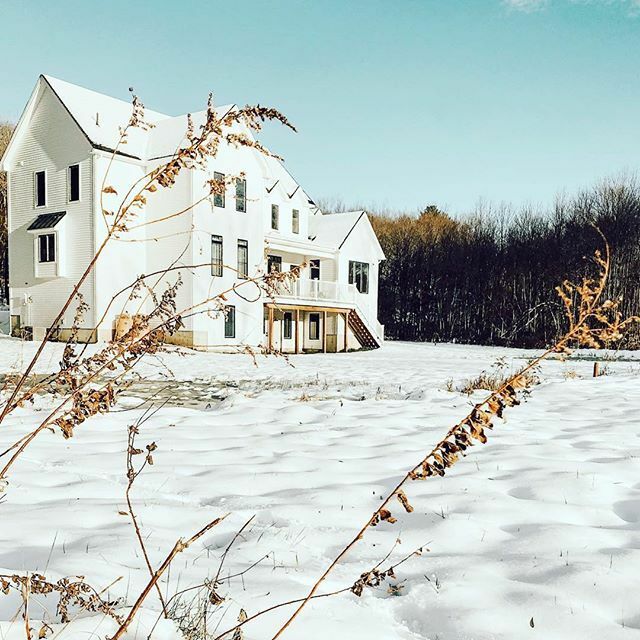 This unique farmhouse is definitely both grand and cozy, serving as a stylish forever family home.